Aangan Episode 1 Review – Family Drama! So, we got introduced to a big family living under 1 roof, comprising of parents – the father (Qavi Khan), the mother Zaitoon Bano (Samina Ahmed), their 3 married sons & 1 unmarried daughter. 1 of the 4 sons lives in Germany & 1 married daughter & her husband reside in Lahore too. So, the focal point in this family was Zoya’s (Mansha Pasha) marriage & the fact that Zoya comes from a joint family was what impressed her prospect mother in law the most. It was intelligently shown that from the surface, everything seemed perfect & they all looked like 1 happy family but when magnified, they were just ordinary people with some extraordinary problems that too with one another. 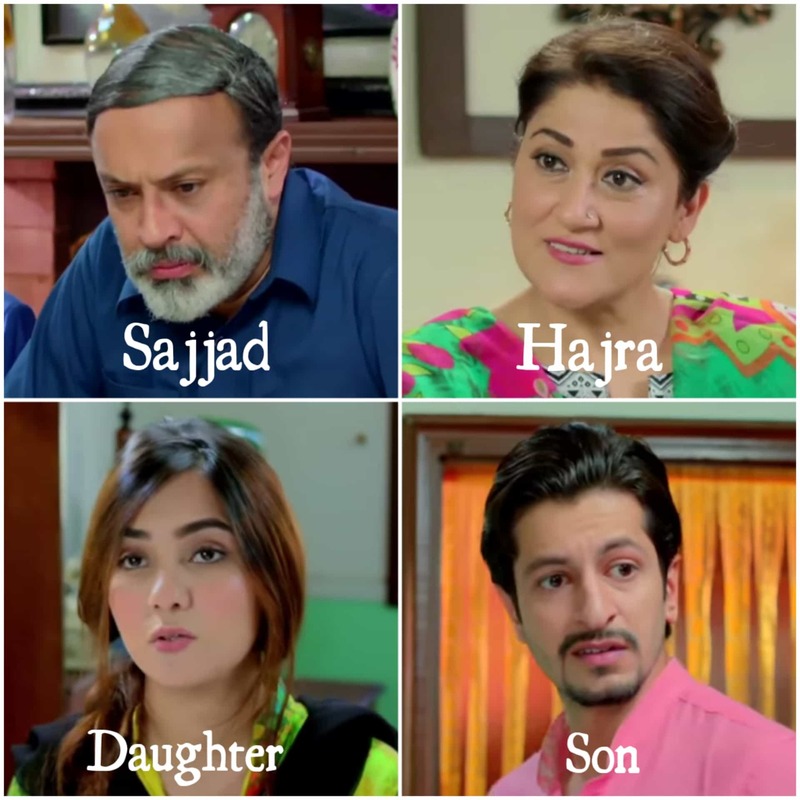 Hajra (Irsa Ghazal) being the eldest Bahu is supposed to pacify everyone after they have a conflict. Hajra’s husband Sajjad (Noor Ul Hassan) is the bread winner who has to take care of the major expenses. Then there is Laila (Iffat Omar), the second Bahu who is a bit too smart to knows how to victimize herself in order to get away with everything. Laila’s husband Asim (Hassan Ahmed) is the calm & composed son who is doing well for himself financially but is also under his wife’s influence as he only believes his wife’s side of the story. Then there is the third Bahu Rubina (Uzma Hassan) who sees herself as a victim because she has her own complexes & complains in regards to her husband. Rubina’s husband Zahid (Paras Masroor) believes in striving for the Afterlife & because of that he doesn’t pay much attention to the life he has to spend in this world & that turns out to be the bone of contention between him & Rubina. So, now when the entire family had to come together to fix Zoya’s marriage & do their homework before finalizing everything, each & everyone came with their own baggage because all of them are interlinked with one another in a way that they just can not ignore & move one. This was the aspect that I enjoyed watching the most where all of them had issues with one another but also knew that they had no escape so the best they could do was fight about it & then move on. In the middle of all this chaos, the one who remained unaffected was the father. I loved his approach where he would pass the verdict about everything with so much of finality & share his frustrations out loud but when he would be asked to showcase his authority, he would prefer staying in his room watching TV, haha. Even the father knows that he has no control over what goes around him so he only shares what he feels with his wife. 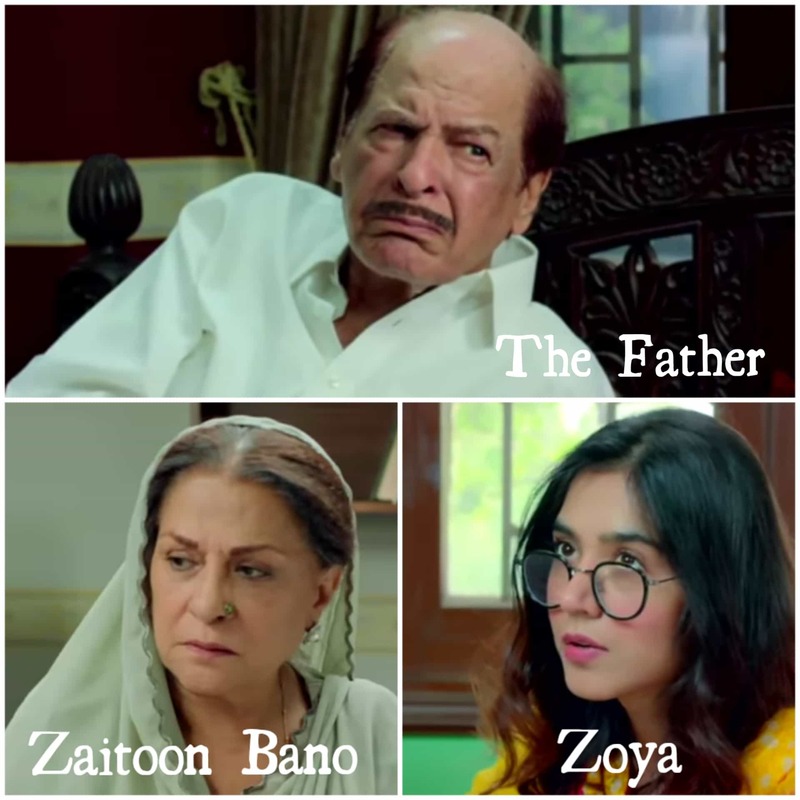 I also loved how Zaitoon lied in front of everyone covering her husband’s laid back attitude as she still wants everyone to think of him as a head of the family. It was so realistic how even the sons knew about their father’s nature but chose to smile on their mother’s lies as they knew where she was coming from. Zoya is the one who does most of the heavy-lifting as she has no other life than this. Zoya also knows that after marriage her life, her activities will remain the same, that is why she wasn’t really thrilled with the news of her marriage. Even though Zoya has lost hope & she really doesn’t think the marriage will bring anything new in her life, she knows she has to abide by what everyone will decide for her. So, the married daughter Anila (Zainab Qayyum) & her husband Allauddin (Waseem Abbas) are the complainers of the family. They are the ones who love getting all the attention in the world & despite that, they would still complain. Even though they have their own lives, their own set up, they still believe that they run (read ruin) things in Zaitoon Bano’s house, that is why the news of their arrival sent a shock wave in Zaitoon’s home because everyone knew what they were getting into! In this family, everyone wants everyone’s attention. Everyone feels the need to fight for the last bit of attention which would make them feel valued, that is why, even though Laila & Asim initally said they wouldn’t go to Zoya’s in laws, the moment Asim saw that Zahid wanted Rubina to be a part of the event, he spoke about Laila too. I think the best part about this story is going to be the different perspective of all the different characters, like in this episode, everyone had his or her own perspective, where they even fought over certain things but no one seemed wrong because they all were right in their own place. I think this is what is going to make this drama quite interesting & entertaining because there would never come a time where they will all come to a common ground & that will create interesting scenarios. Overall, I found the first episode to be perfect & intelligently written because to introduce so many characters while still making their personalities come through is not an easy feat but writer & the director seemed to have worked in harmony to make it so impactful. All the actors seemed to be in their element but I loved the performances of Qavi Khan, Paras Masroor, Uzma Hassan & Iffat Omar the most. It is good to see how all the actors have paid special attention to their get up because it spoke a lot about their background & gave us an insight into their personalities. The first episode has skyrocketed my expectations of this drama & I am sure everyone else is feeling the same way. Really looking forward to the next episode. Please share your thoughts about this episode of Angan. Ps: If anyone can tell me what the Father’s name was, I’d appreciate it.